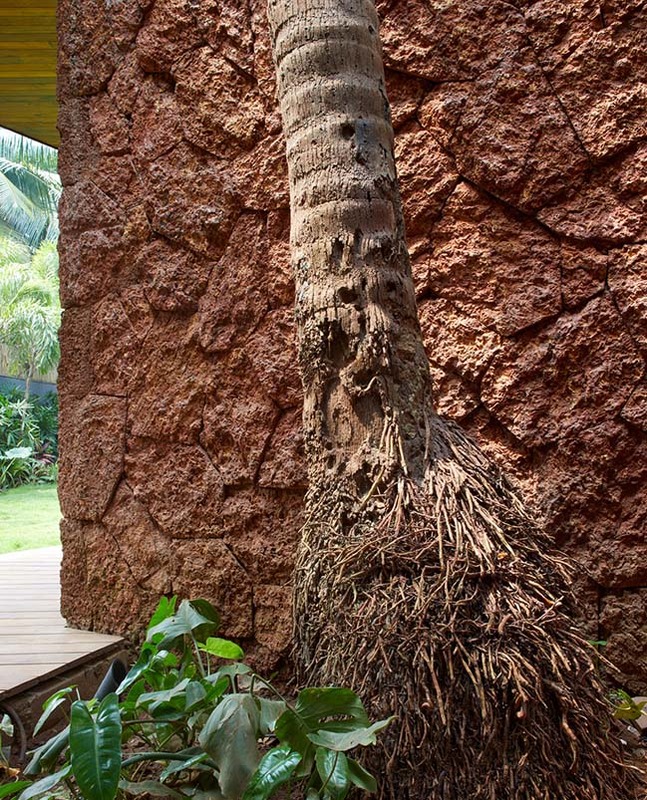 Villa in the Palms is named after the 19 towering coconut palms that thrived for decades on the land, which dictated the villa's concept and footprint. 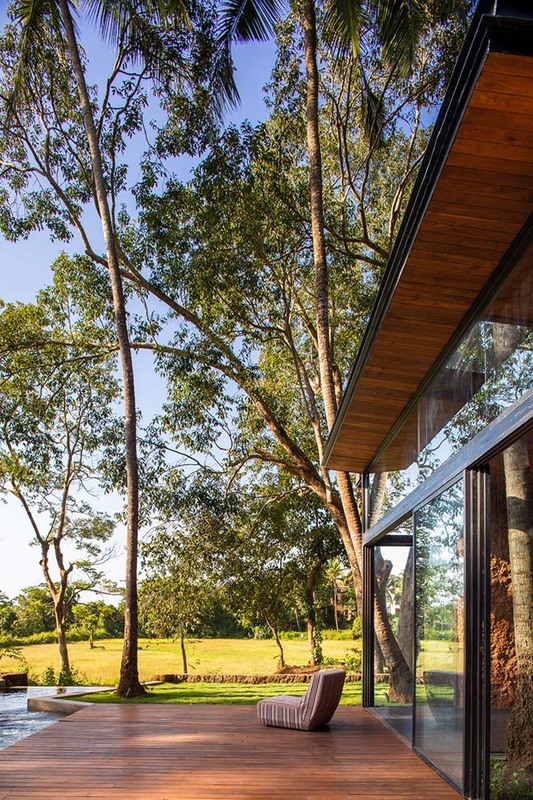 This four-bedroom house overlooks a field and a seasonal stream. 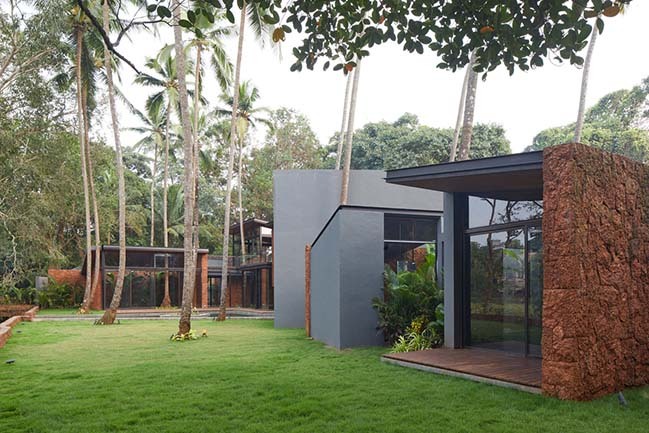 Gross Built Area: 610 sq.m. 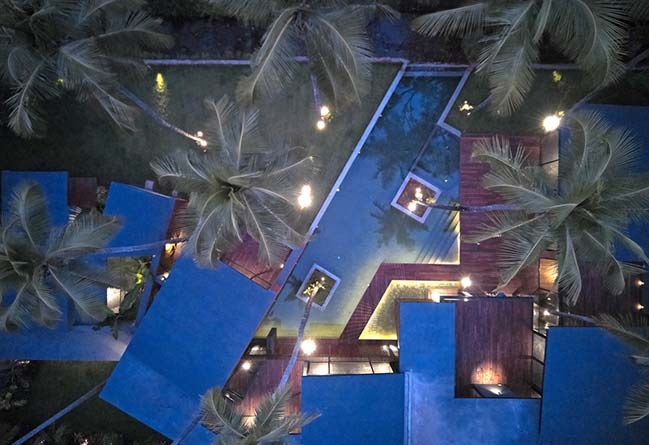 From the architect: Embedded into the natural landscape, Villa in the Palms appears almost village-like, pockets of small homes nestled between 80-year-old coconut trees, nearly invisible from points further up the approach road. 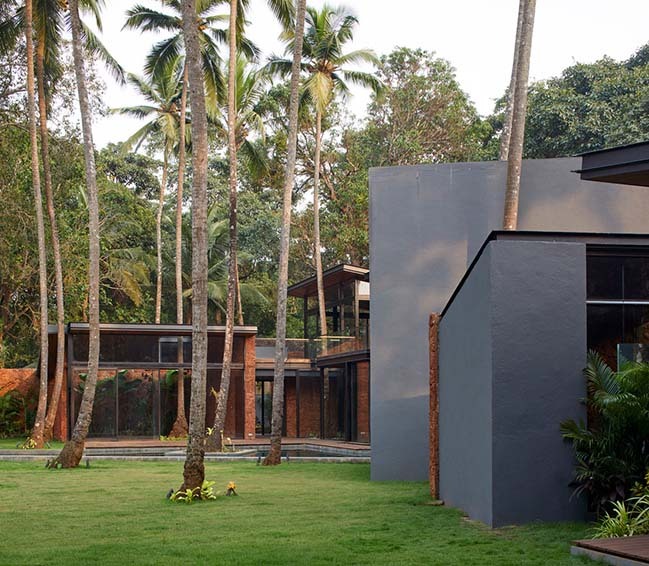 The fact that the trees on site existed for decades gives the overall house a very rooted presence. 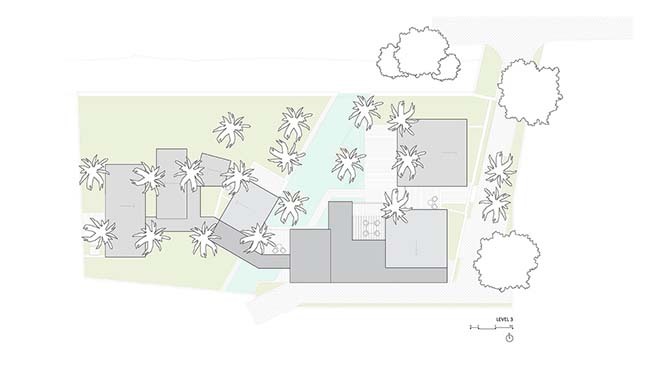 Designing a regular building block would have required the cutting down of several trees to accommodate the programme. 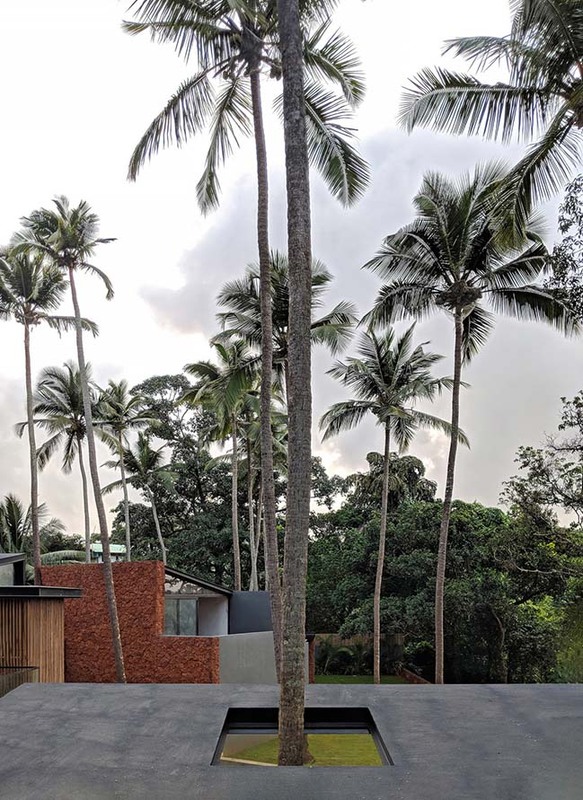 To avoid this, the building was carefully designed between the trees, without disrupting the surroundings, and not a single tree was felled during construction. 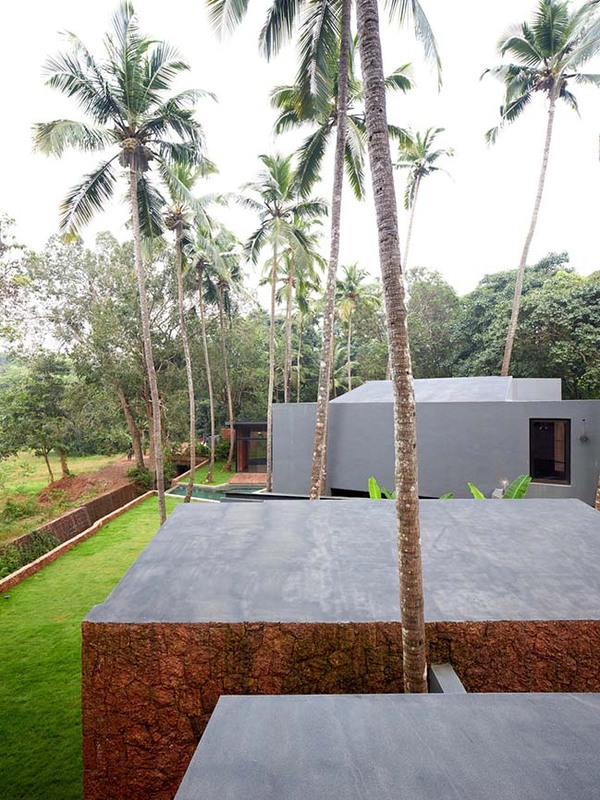 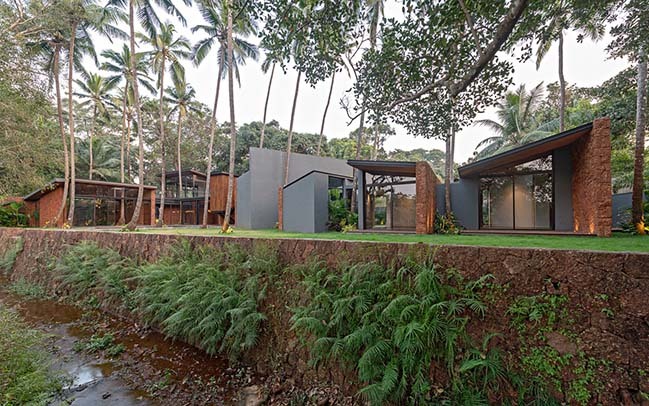 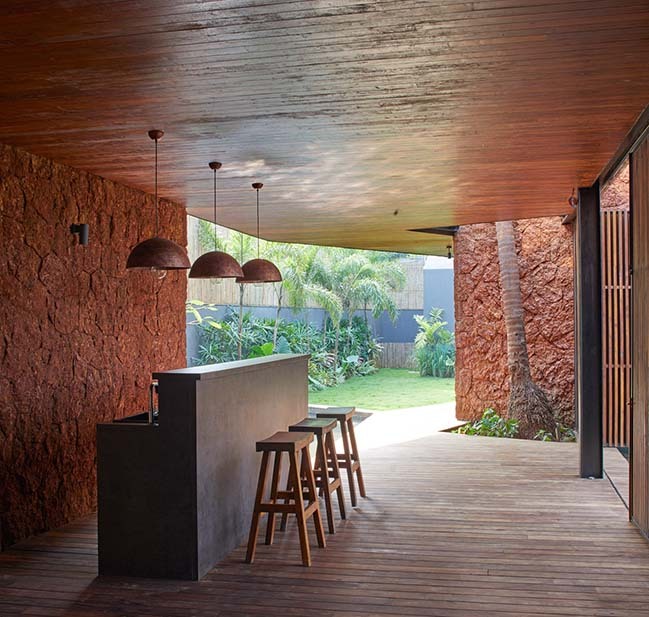 Consequently, the structure is fragmented rather than monolithic, reminiscent of an old-time Goan village but at the same time entirely modern. 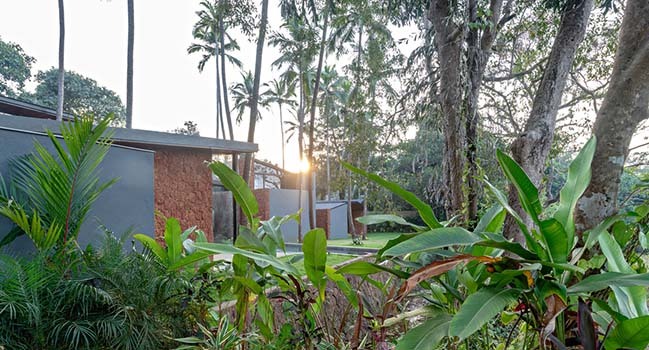 Each bedroom on the ground floor, for example, feels like a separate home, replete with an en-suite bathrooms, a rear garden, a front garden and an internal courtyard flanked by laterite walls. 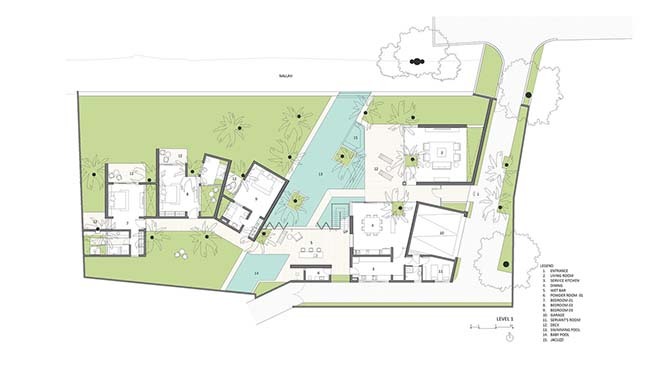 These independent volumes are interconnected with decks, passages and bridges that meander through the trees and over pools and gardens. 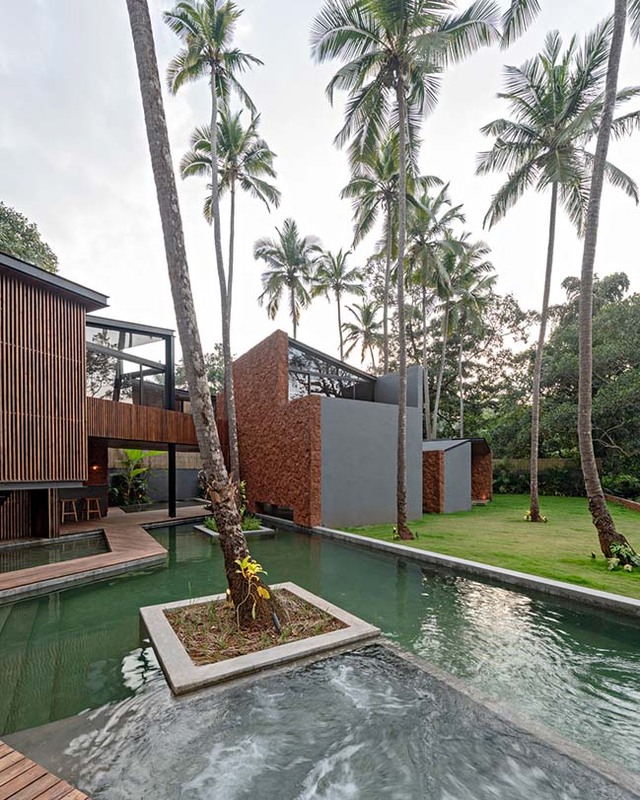 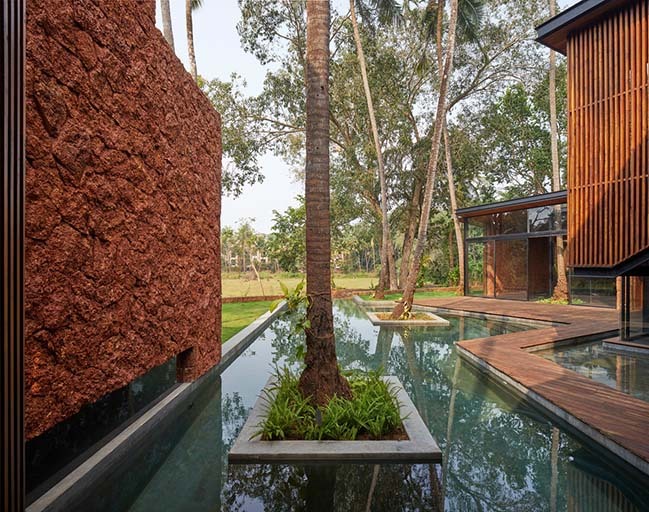 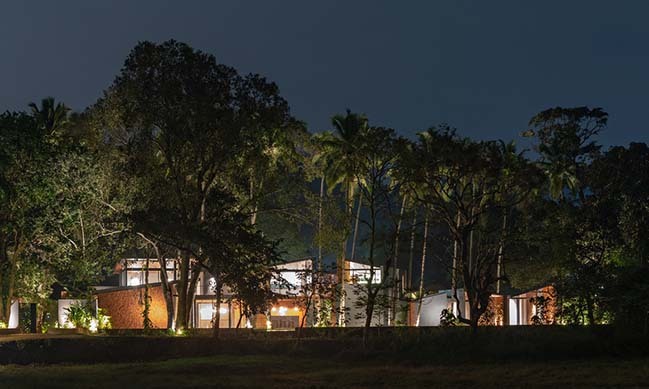 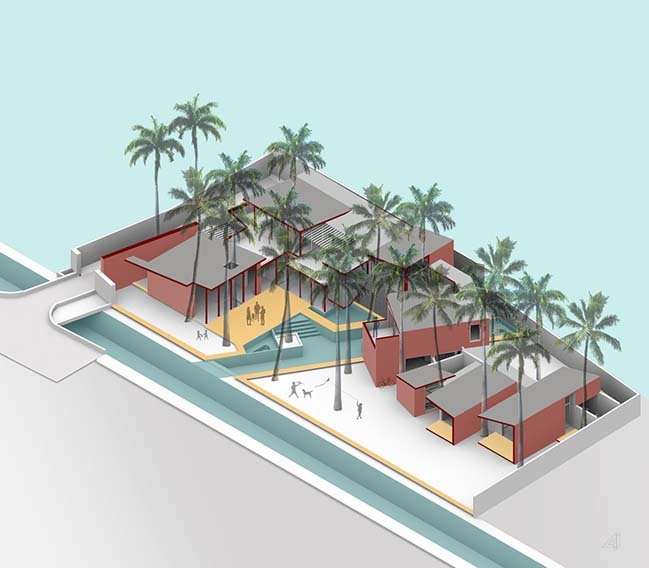 The building design adopts distinct local features and materials of the tropical coastal state of Goa, with exposed local laterite stone walls, sloping roofs and screens made from 100-year-old recycled teak wood, while the landscape design consists of local tropical species (mostly various types of palms) that maintain their lush greenery through the year. 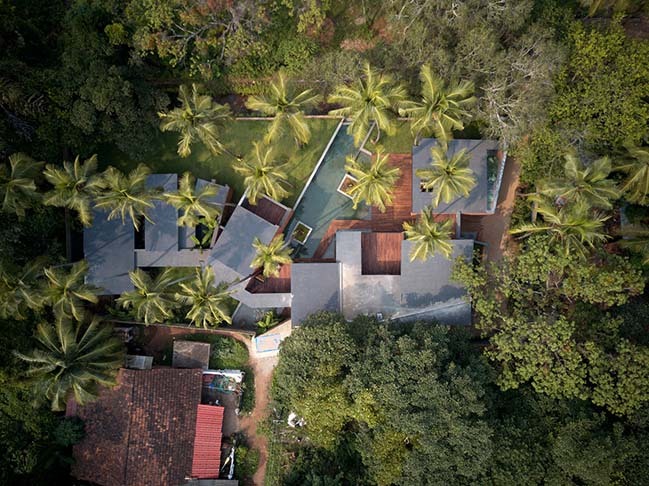 Roofs pitched at different angles pay homage to the monsoons and accentuate the staccato nature and fragmented aesthetic of the building. 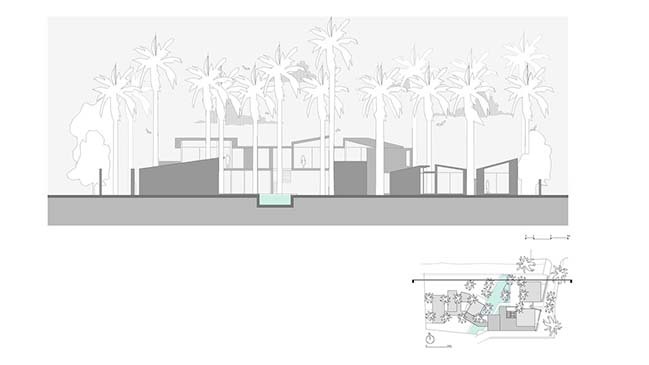 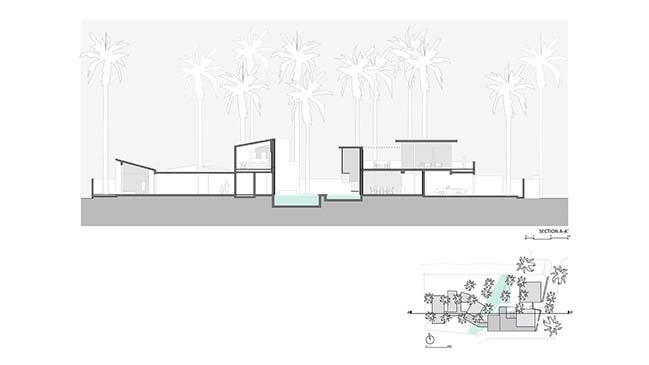 The interstitial roofs which cap each unit individually harvest rainwater, while further visually integrating the building in the lush landscape. 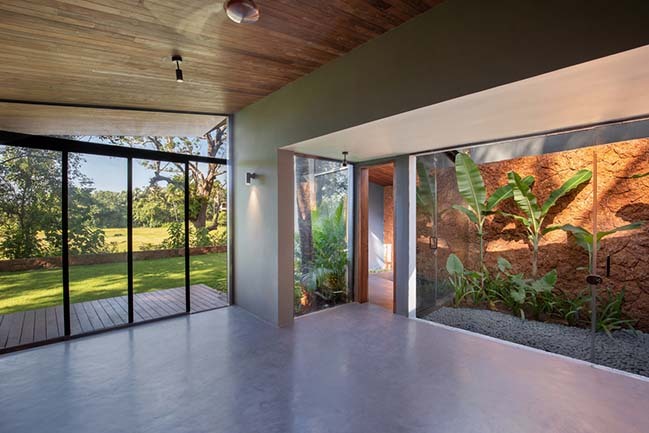 Boundaries between the inside and outside are blurred and vast open spaces connect each living space. 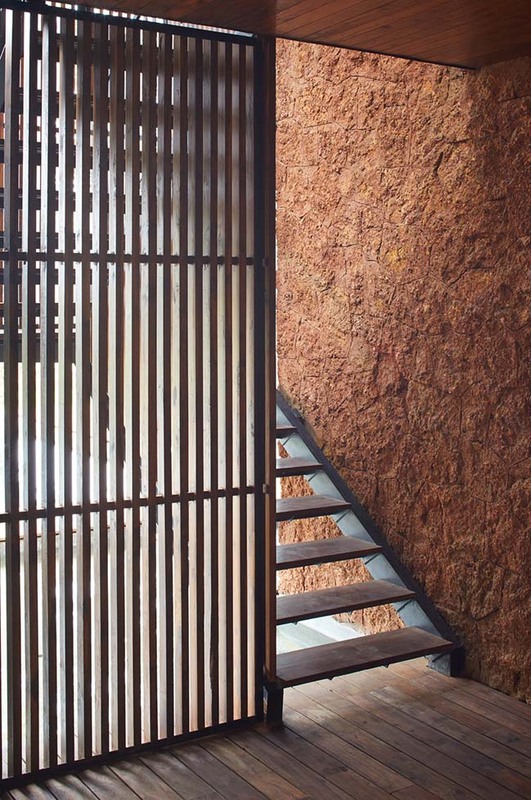 While everything is open and filled with light and air, the house is still very private. 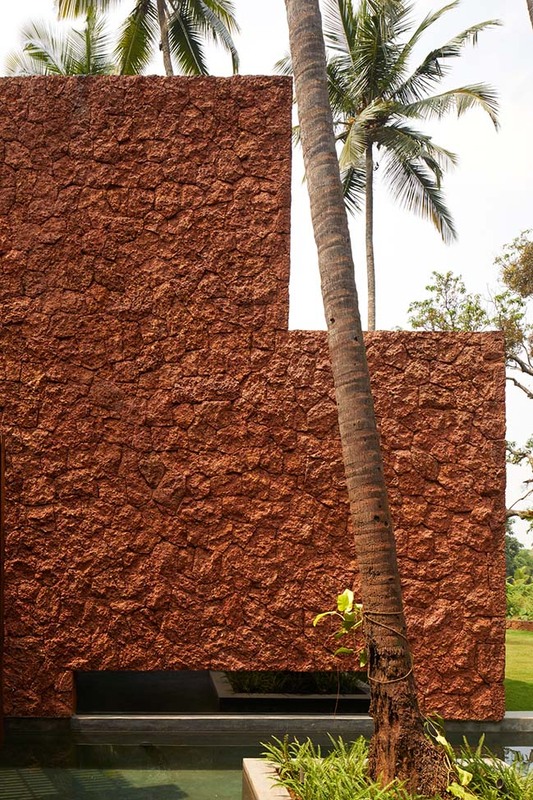 The laterite walls thermally and visually shield each room, maintaining privacy while orienting for the best views of the northern field. 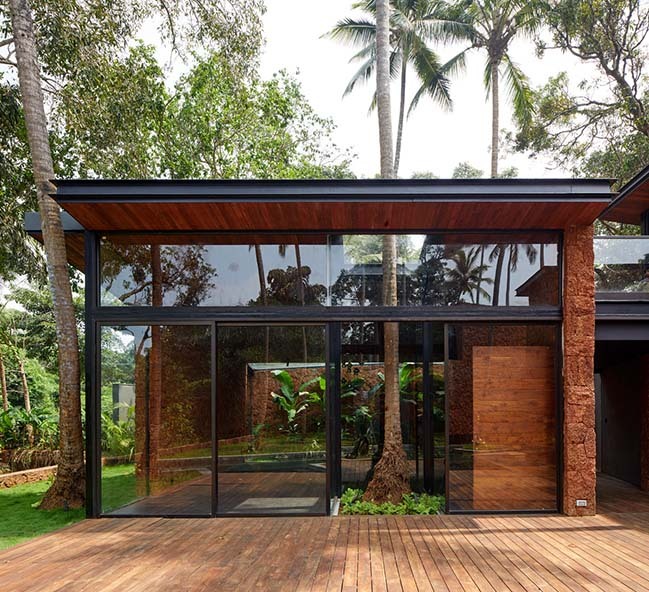 The Northern façade on the other hand opens with large recessed glazing to the fields while not increasing the solar gain. 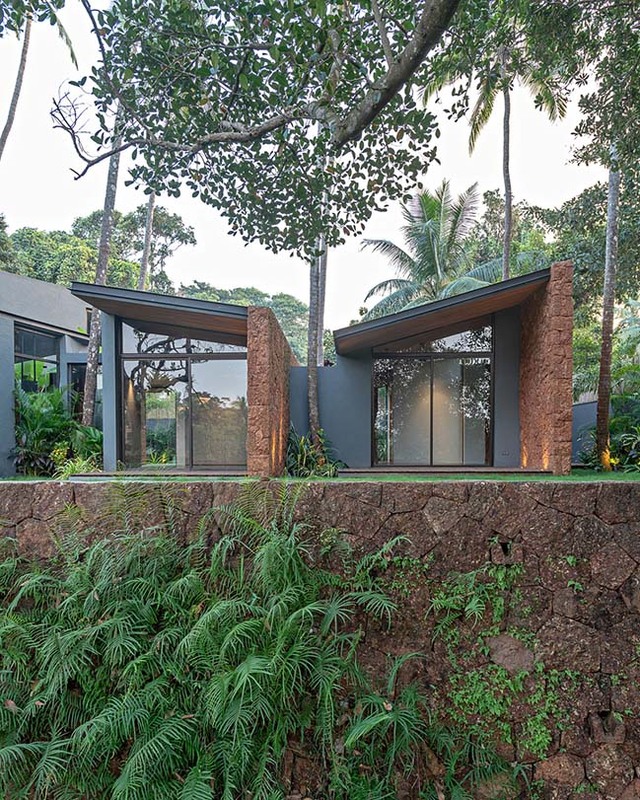 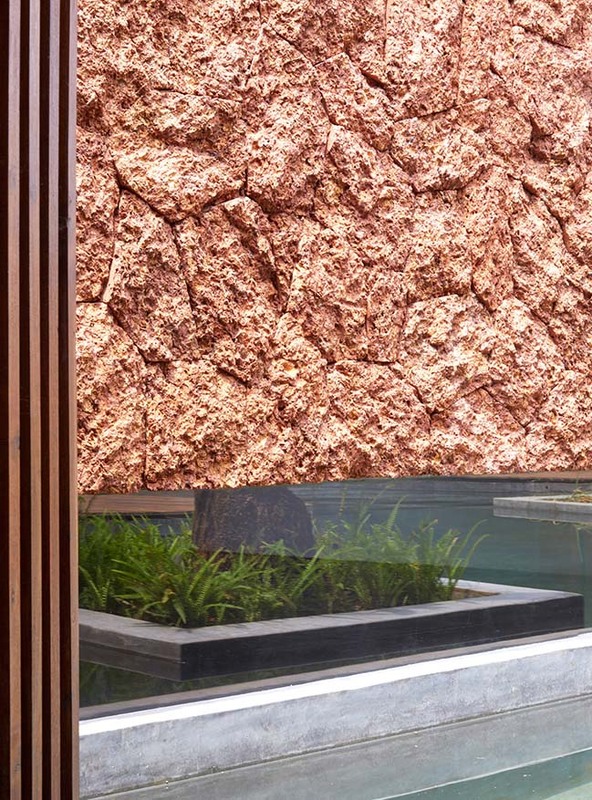 With the thermal mass of the laterite walls, open northern facades & open internal courtyards, the house creates and is designed to be environmentally responsive to its siting, sustainable as far as a private home can be, while respecting the local environment and geography. 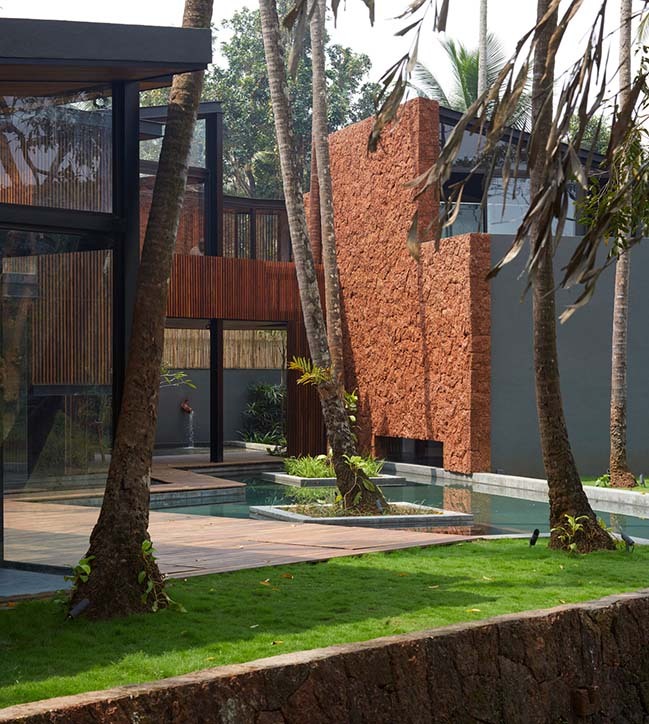 The main entrance features a kind of dramatic crescendo, with a view that widens with each footstep - first some exposed laterite stone, then a glimpse of the pool, then the gardens and finally the wide field beyond. 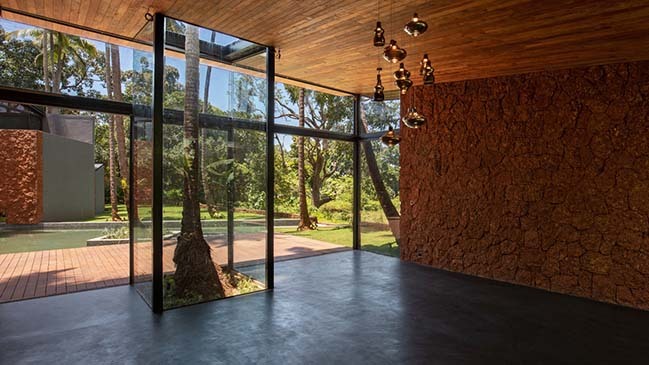 At one side is a sky-lit living room with internal garden and walls of exposed masonry. 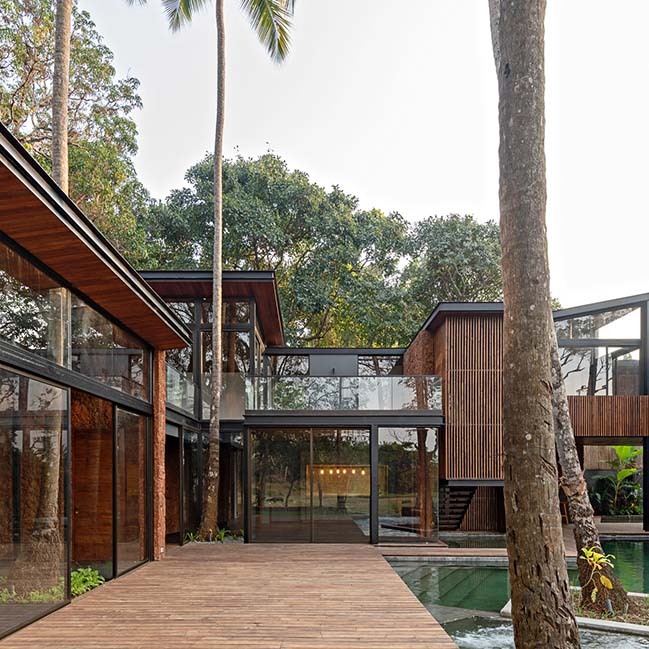 At the other side is an open kitchen and dining room featuring a wet bar, all overlooking an expansive deck and pool (three distinct water bodies are separated by teak-wood bridges and tree islands). 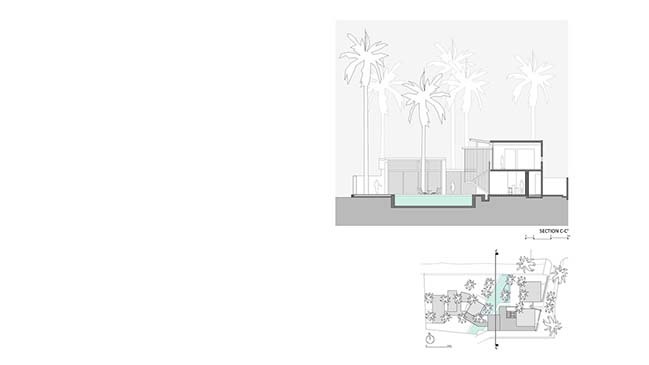 The infinity swimming pool is fully integrated with the villa, dividing the semi-private areas from the private ones. 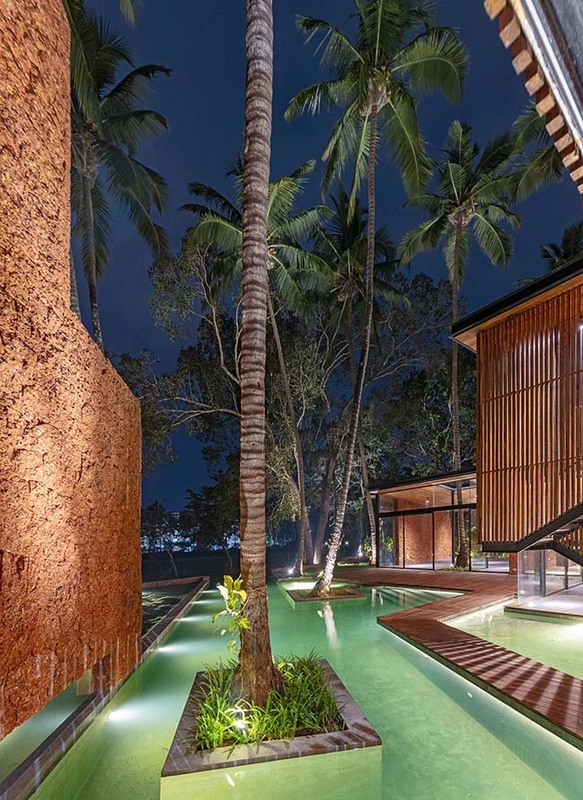 A bedroom abuts the pool, with a slit window along the floor that enables the ripples of water to reflect onto the ceiling. 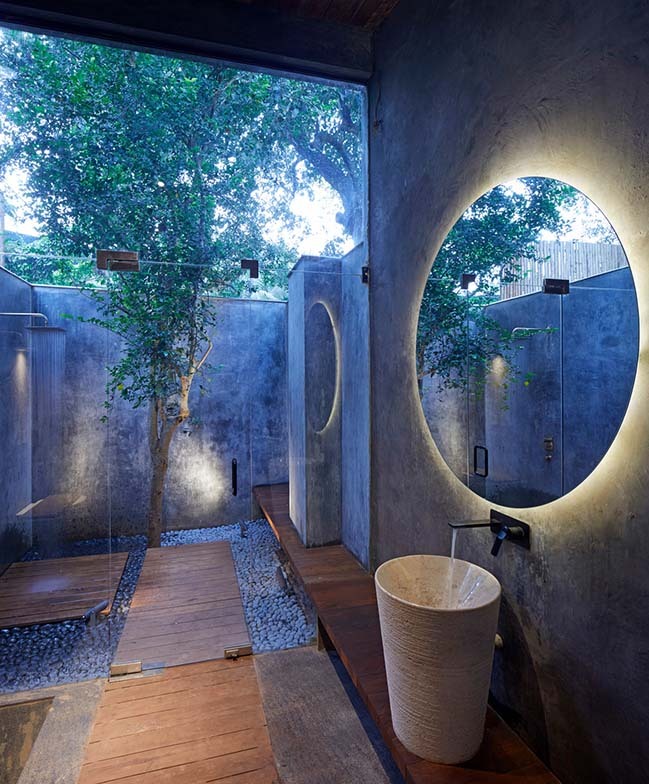 All the lower floor bathrooms have in-built sunken bath tubs to enjoy the adjoining courtyard landscapes. 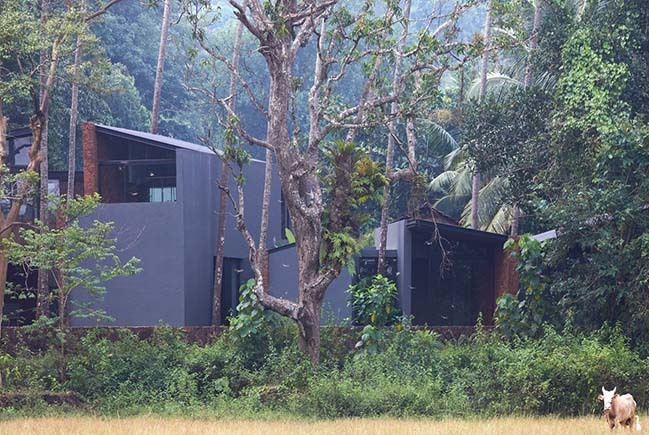 The last bedroom features a serene indoor-outdoor bathroom where light and shadow create everchanging landscapes. 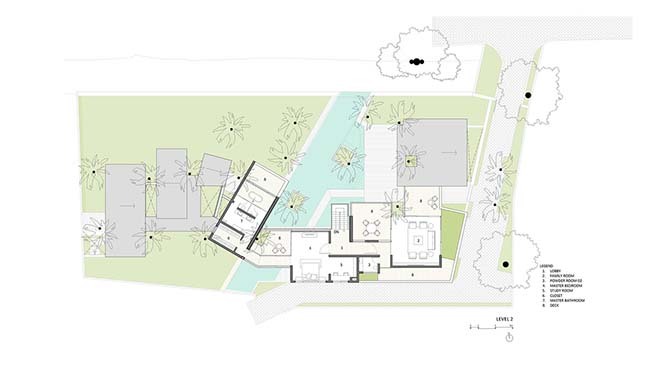 On the upper floor there is a family room, powder room, top-floor garden and an exquisite master suite. 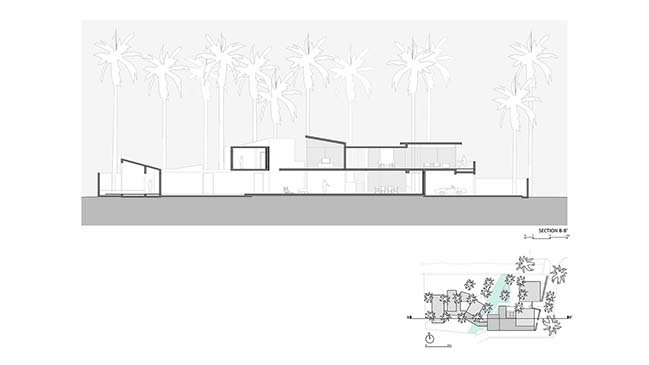 The latter consists of a bedroom and an open library, with a windowed "sky bridge" separating the bedroom from a walk-in closet and large master bathroom. 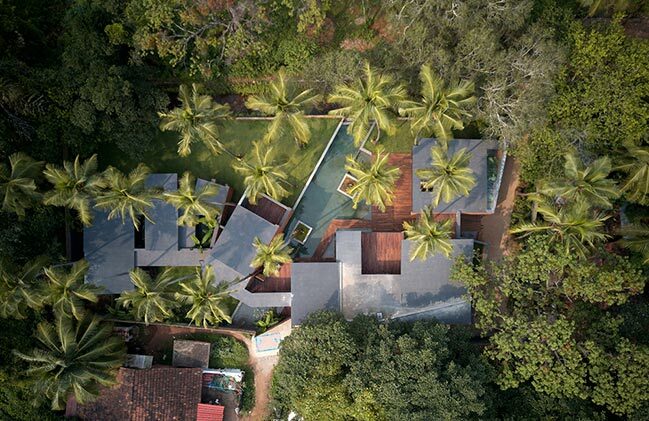 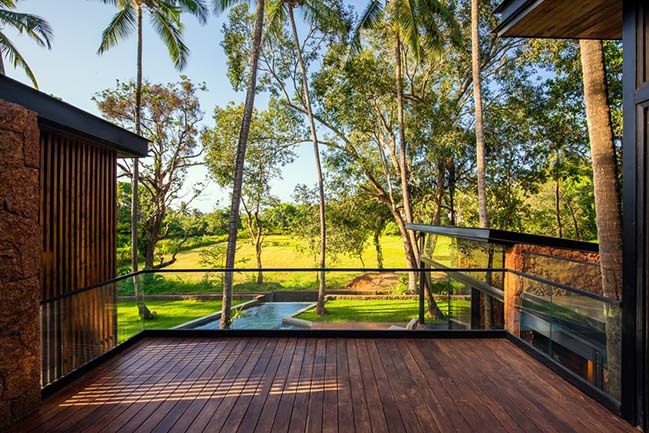 The views from upstairs consist not only of the open field to the north, but also a "Goan jungle view" to the south, replete with red-tile rooftops of the adjoining village.